The low design of our Low Modern Attic Bed Frame has become a customer favourite with its contemporary, refined and practical design, creating a stunning focal point for any bedroom. 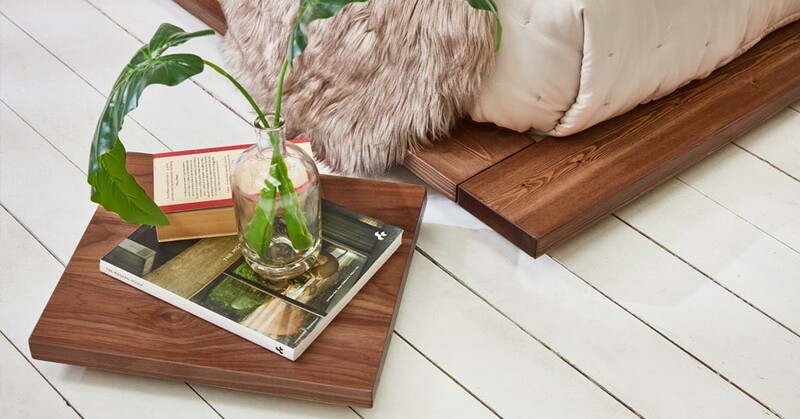 It draws its roots from the traditional Japanese practice of near floor sleeping, bringing an element of culture to your home. As with every handmade wood bed that we sell, the The Low Modern Attic Bed Frame has been carefully handcrafted by our team of experienced carpenters and joiners, here at our workshop in Britain. Our beds are constructed with Solid Scandinavian Pine, which we have made the utmost effort to source sustainably from FSC and PEFC approved forests. It’s this sustainable timber that is the core of each and every handmade bed frame we offer. 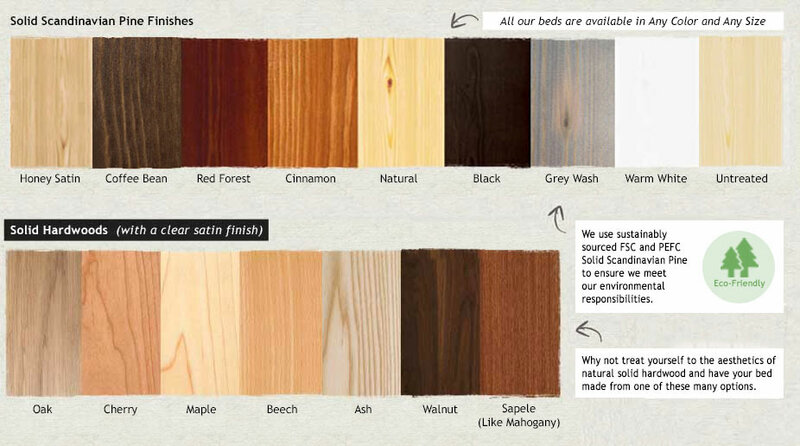 Your bed can be finished in any of our selection of satin stains, with colours popular for the Low Modern Attic Bed including a modish white, sublime grey and a refreshing sandy. Why Is The Low Modern Wood Bed Perfect For You? The main appeal of our The Low Modern Attic Bed is that it has the power to make your bedroom appear much more spacious. The wood bed frame is ideal for tight and restricted spaces, such as bedrooms that have a low or sloping ceiling. Our Low Modern Bed is highly convenient, due to its minimalist low design, it creates a spacious feeling for your bedroom, making it an ideal in loft or attic bedrooms. When it comes to bedrooms that have a height restriction, low bed frames are the definitely the best option. Our handmade low beds provide a spacious alternative to your bedroom, for those that don’t want a standard height bed. The The Low Modern Attic Bed is also a highly popular choice for children's bedrooms, as the low height provides more safety than other bed types. The design of the Low Modern Wood Attic Bed is created from using the lowest rails within the bed frame to be inset slightly. 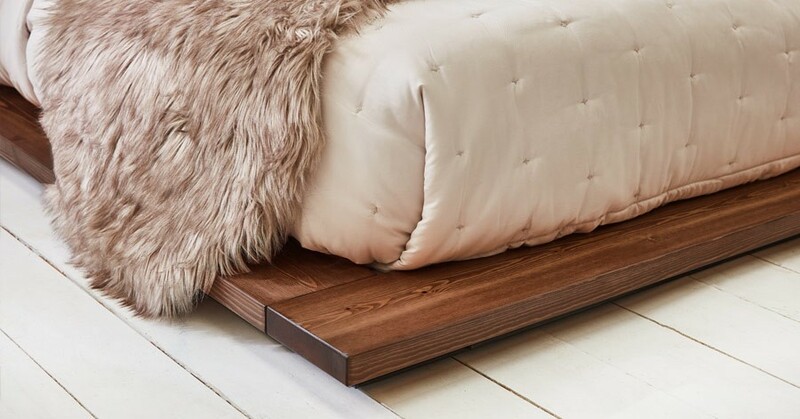 This creates a bespoke floating effect on your low bed frame. All of our wood bed frames will arrive to your house conveniently flat packed to ensure that it can easily maneuvered into your bedroom. They come with a set of easy-to-follow instructions, making the construction of your low wood bed frame simple. Our wood beds are all handmade to order by our experienced craftsmen. This means that if you have a specific bed size in mind or a bespoke requirement, you can give us a call and we can make custom alterations to your bed frame. The Low Modern Attic Bed is one of several unique designs amongst our bespoke range of low bed frames. If you enjoy the style of our Low Modern Bed frame, then you may want to take a look at our Low Loft Bed and our Low Platform Bed (Space Saving). 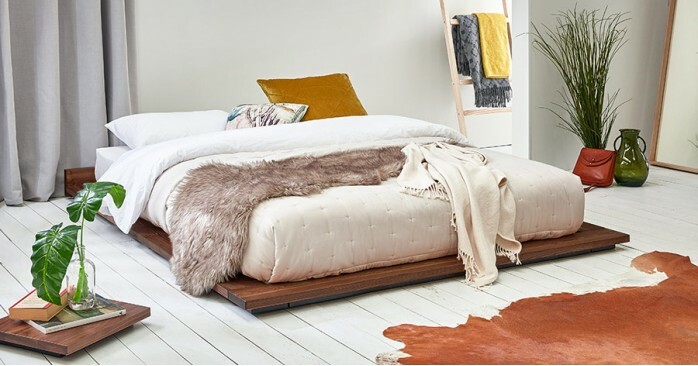 The handmade Low Platform Space Saving Bed is fairly similar to our Low Modern Attic Bed, as the mattress sits on top of the bed frame rather than inside it. We would also certainly recommend the space-saving Low Platform Bed as an excellent choice for those that want something a little higher than the Low Modern Attic Bed frame. Please note: Bedding is sold separately to our range of wood bed frames.